Posts tagged "Cheap Promotional Signs"
Perth Graphics Centre makes these every day. Usually made from corflute, our cheap plastic signs are direct-printed, ensuring quick turnaround and no vinyl curling up on edges. Our corflute signs are lightweight, strong and extremely vibrant in colour. Perfect for promotional signs, corflute is easy to cut to size and easy to transport. Political signage is also made from corflute, as it’s done quickly and on a budget. 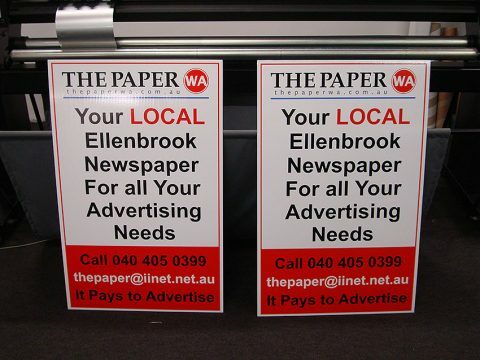 If you need cheap plastic promotional signs, then call Perth Graphics Centre today.